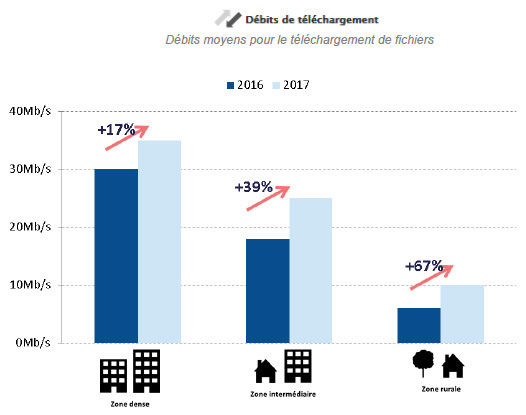 Arcep is publishing the results of its 18th annual quality audit of the the services sold by mobile operators in Metropolitan France. More than a million measurements were taken on 2G, 3G and 4G systems across the country, in every department, both indoors and outdoors, and on transport systems: regional railway (TER), suburban “Transiliens” railway, commuter trains (RER), the underground, high-speed railway (TGV) and motorways. The audit focused on the most widely used mobile services: web browsing, video watching, data transfers, texting and voice calls. The purpose of the tests that were performed was to assess the performance of operators’ networks in a fully comparable fashion, and this under a wide variety of conditions and circumstances. The scope of the audit was expanded considerably this year. The number of measuring points in residential areas was doubled. Regarding transport routes, quality was measured on all of the country’s motorways and, for the first time, on some twenty major roadways as well. By the same token, every TGV and Intercités line was tested this year, and more than 60 TER lines. 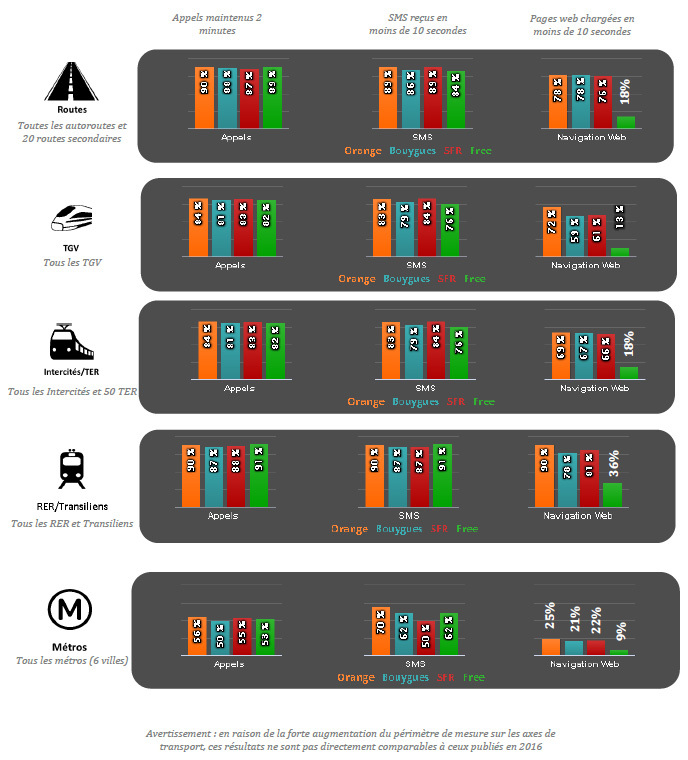 Lastly, Arcep measured the quality of every underground public transport system in France this year: i.e. in the cities of Lille, Lyon, Marseille, Rennes and Toulouse. With the exception of Free Mobile, every operator has improved the quality of their data services. This progress echoes operators’ 4G rollout efforts. Orange is the operator with the highest overall score for this audit, while Bouygues Telecom and SFR are virtually tied for second place. Lastly, Free Mobile scored considerably lower on a significant number of indicators. 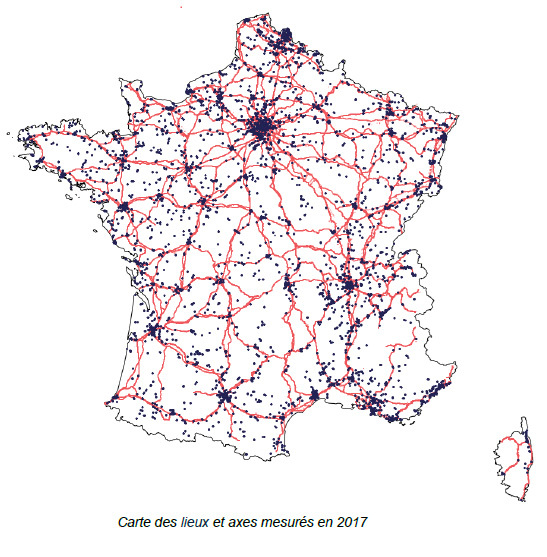 The detailed results, which can be found in the annexes and on monreseaumobile.fr, allow anyone to compare the quality of operators’ services for the uses that matter to them: calling, mobile internet, in densely populated areas, in rural areas, on the train, when driving on the motorway, etc. For the first time, the raw data for all of the tests are available as open data , so that anyone can use and rework the data that interest them. The increase in connection speeds that was observed in 2016 has continued. After stagnating for several years, speeds are also rising in rural areas. 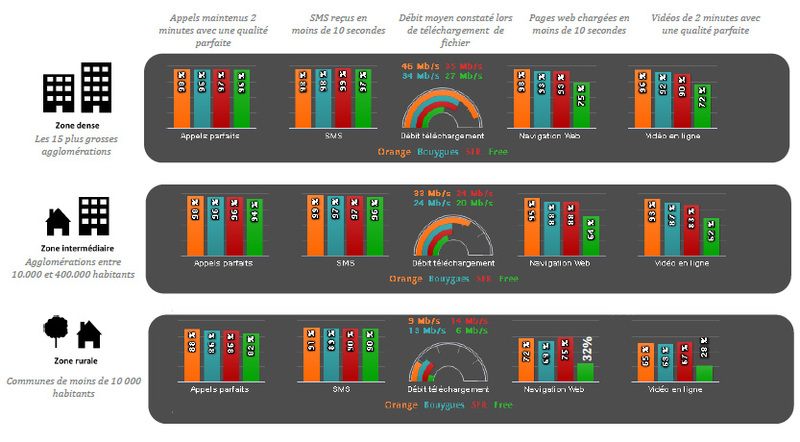 This improved performance for data services in rural areas is a reflection of operators’ ongoing 4G rollouts, and particularly those being performed by Bouygues Telecom and SFR, which are the two operators whose results have improved significantly. If the results echo the fact that operators continue to build out their 4G service footprint, today none of them yet provides this technology in more than two thirds of the country. Arcep will therefore work to ensure that operators maintain their rollout efforts, so that a maximum number of people across the whole of France have access to 4G services, and that performance gaps between the country’s sparsely and densely populated areas are steadily erased.